Â Captain Paul McGinley selected Westwood as one of his wild-card picks in large part because he has played so well in this yearâs most prestigious tournamentsâthe Masters, Players Championship and PGA Championship. âIâm obviously delighted,â said Westwood, after learning of his selection. âThe Ryder Cup has always been a massive thing for me and I was delighted to get the call from Paul. Iâm delighted and honored to be representing Europe again.â Westwood has an overall Ryder Cup record of 18 wins and 6 halves from his 37 matches spanning 17 years. 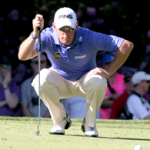 This yearâs tournament, which will be played at Gleneagles in Scotland from September 26-28, will be Westwoodâs ninth consecutive appearance in the biennial match against the United States. Team Europe will face fierce competition from Team USA. The legendary Tom Watson is Captain, and as Assistant Captain he chose Raymond FloydâOld Palm resident, Honorary Club chairman and designer of Old Palmâs spectacular golf course.